Like any ham radio station, the equipment here at WS6X consists of two main parts — the Antennas, often called the "Antenna Farm", and the Radio Room, also known as "The Shack". In this section we will take a walk outside, looking at the antennas in use at WS6X. 4-element SteppIR at 60 feet (40M thru 6M). To describe the WS6X antenna system as a "Farm" would probably qualify as the overstatement of the century! When I moved to the current QTH in Virginia, the plan was to downsize significantly from the antenna system in California. The choice of a 6 acre property "way out in the country" was with the hope of continuing my pursuit of low-band DX-ing. In spite of the downsized antenna farm, the very quiet location, situated at 1400 feet ASL, has allowed me to remain fairly competitive. 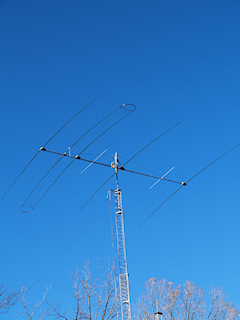 Operating the low-bands from this electrically quiet QTH has given me a new lease on life on 160 meters! Inverted L (66 feet vertical) for 80 and 160 with 32 radials. This is fed at the base with an MFJ 998RT remote tuner. I can use any combination of two with the K3S in full diversity receive. This has vastly improved my RX capabilities on 160 and 80.